Eosinophilic gastroenteritis (EGE) is a rare disease in which a type of white blood cell, the eosinophil, causes injury and inflammation to the stomach and small intestine. When the inflammation and injury occurs in only the stomach, the disease is called eosinophilic gastritis (EG). Both diseases are similar in how they affect the patient, how it is diagnosed, and how it is treated. The cause is unknown in many patients. Food and/or environmental allergies may play a role in the development of eosinophilic gastroenteritis. People who have a personal or family history of allergic disorders may be at higher risk of developing EGE. Eosinophilic gastroenteritis can affect both adults and children. Both males and females are affected, with males slightly more than females. 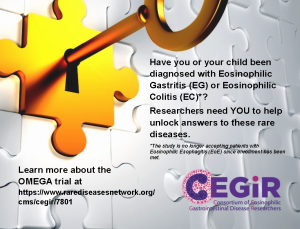 EGE is often seen in conjunction with other forms of eosinophilic disease. Most people who have EGE also have other allergic disorders (eczema, hay fever, asthma) and/or have food intolerances or allergies, especially children. A smaller percentage of sufferers may also have a family member with a similar eosinophilic disorder. Eosinophilic gastroenteritis is diagnosed by an upper endoscopy where a small tube is directed through the esophagus, stomach, and the small intestine. This tube allows the doctor to see any visual changes in the tissue, such as erosions or irritated areas of the stomach and small intestine. The doctor will take small tissue samples (biopsies). The biopsies are examined under a high-powered microscope to see the small cell structures. If eosinophils are present in the sample, the pathologist will count how many are visible. The stomach typically has low numbers of eosinophils present, and there are no consensus guidelines to suggest a threshold for what is considered elevated. Therefore, diagnosis is based on clinical symptoms, visual evidence in the endoscopy, the pathology report, and how well the patient responds to therapy. High levels of eosinophils in the stomach may also be caused by other conditions such as helminthic infections (e.g., pin worms, hookworms), inflammatory bowel disease, autoimmune disease, celiac disease, drug reactions, and in association with hypereosinophilic syndrome. There are no consensus guidelines for the treatment of eosinophilic gastroenteritis. The goal of the treatment is to reduce the inflammation and damage caused by the eosinophils. Dietary Therapy – Dietary therapy involves removing suspected causative foods; eliminating common food allergens such as milk, wheat, soy, fish, shellfish, peanuts, tree nuts, and eggs; or removing food entirely from the diet and relying on specialized formula for nutrition. For some patients, especially infants, only a few foods are identified as causing the problem (typically milk and/or soy), and once those foods are removed from the diet, EGE resolves. Medications – Medications such as systemic steroids (prednisone) or other anti-inflammatory medicines may be prescribed. If the patient is iron deficient, iron supplements may also be recommended. To evaluate how you are responding to treatment, periodic endoscopies with biopsies will be performed. Prognosis of EGE depends on the response to treatment. EGE is chronic with periods of activity and periods of apparent remission. Q: Are there consensus guidelines for EGE? The value of the consensus statement on eosinophilic esophagitis is that it came from existing medical literature rather than just opinion. Comparable data for EGE does not exist, and most literature is limited to case studies (very small numbers). Research is being done, but it is difficult to get enough patients. Given the apparent increase in cases noted around the country by many physicians, it is likely that more research findings will develop in the next few years. Q: Can the treatment info on EoE be applied to EGE? A: The global approach to treating all eosinophil-associated gastrointestinal disease (EGID) is to reduce inflammation. The principles of treatment are the same between EGID subsets. Continued monitoring for development of inflammatory bowel diseases should always be considered since some treatments for eosinophilic gastroenteritis can also mask the development of inflammatory bowel diseases, such as ulcerative colitis or Crohn’s. Q: Should I be concerned about scarring from repeated scopes and biopsies? A: The risk of scarring from endoscopy itself is virtually zero. The scope itself does not cause trauma under normal circumstances, and the size of the biopsies are very small. There is a small risk associated with repeated anesthesia; and there is always risk with any procedure. A: EGIDs are generally not immediately life threatening, though they have a significant impact on quality of life. Complications from EGIDs can develop that may become deadly without intervention, such as severe malnutrition, dehydration, or food impaction due to structural changes in the esophagus. These issues are more likely to have significant impacts on infants and young children unlike teens/adults who can describe difficulties more easily. Eosinophilic gastroenteritis: review of a rare and treatable disease of the gastrointestinal tract. Mori A, Enweluzo ;C, ;Grier D, Badireddy M. Case Rep Gastroenterol. 2013 Jul 16;7(2):293-8. doi: 10.1159/000354147. Eosinophilic gastroenteritis and related eosinophilic disorders. Prussin C. G astroenterol Clin North Am. 2014 Jun;43(2): 317-27. doi: 10.1016/j.gtc.2014.02.013.